In this electrician WordPress themes roundup, we have put together the best niche specific templates for electrician and electricity services websites, contractors and companies, electrical repair and other specialists. Electricity is an indispensable part of today’s life. Right from the early morning up to late at night, we are used to apply thousands of equipment and gadgets, instruments and digital technologies which are powered by electricity. And whenever we are faced with some problem catering to electricity supply or want to install electrical system or equipment, the first thing we do is to look for a professional and qualified electrician or electrical service provider to turn to. The modern digital platform is the biggest gathering place for all kinds of service providers and handymen, craftsmen and electricians to offer their services. Whether you want to grow as an individual specialist or a part of a big company, having your special place in the digital arena is crucial for you. It well help you gain more attention, exercise new communication channels and master the given market to get better jobs. In this article, we are excited to share the best electrician WordPress themes with you to go online with your website in a matter of minutes. All of them are wonderfully practical and simple in usage while providing you with hassle free management and customization procedures. Fix IT is one of the durable electrician WordPress themes guaranteed to work stunningly under any given circumstances. If you are a licensed electrician who has passed all training and now want to win new clients from the virtual domain, this template will be ideal for your needs. Visually engaging and motivational, functionally stable and seamlessly usable, this website builder is also well prepared for different management options. Dozens of time saving features are included in this template for you to realize any kind of website related plans as quickly as needed. The range encompasses very easy to use and control framework with Google fonts and icons, plugin compatibility with WooCommerce, NextGen Gallery and Contact Form 7. Complete documentation and personalized support for each and every theme purchaser are also guaranteed with Fix IT. Service provision industry can highly benefit from the theme called HVAC and Cleaning. IT can be an all inclusive and comprehensive website solution for air conditioning, cleaning, moving and packaging, electrician, plumber, cabinetmaker, interior designer or any other home and household service provider. A perfect usability has been set in all fronts of the theme. In the visual front, it is pixel perfect and eye catchy; in the functional front it is stable yet extensible with the help of compatible plugins. When it comes to the financial battlefield, it is surprisingly affordable and cost conscious. Widget friendly technique is applied in footer, header and sidebar areas to add contact details and other relevant content, and 5 level dropdown navigation is assured which is smooth and clutter free. SKT Construction Pro is the next top level website tool reasonably included in our assemblage of electrician WordPress themes. This enviably powerful template holds safety, user centric performance and responsiveness in the highest regard. It means you don’t need to worry about how your website is going to behave when it comes to responding to different platforms and screen requirements. Both your desktop and mobile users are top priorities of SKT Construction Pro. The theme is also shortcodes based, provides animated sections and controllable fonts, colors, backgrounds and more. With 5 page templates and homepage slider with 10 manageable effects, this template has been tested across different useful plugins and confirmed its consistency with them. Page builder, slider, gallery and commercial plugins are all compatible with SKT Construction Pro. Perfect Mechanic is one of the latest WordPress powered templates catering to the service provision sector, including mechanics and electricians. It comes as a depot of first class theme features and elements which are compulsory for the smooth and flawless web creation and management process. If you are a local electrician or another relevant specialist who wants to take his business to a higher level of client recognition and engagement, you are in the right place. Your specialized website based on Perfect Mechanic as one of responsive and mobile friendly electrician WordPress themes will be #1 advertising and marketing tool for you since it is also SEO and SMO optimized. Get your electrical company or agency, service provision center or private electrician business in front of your potential client base with the help of WoodCraft. Multipurpose and multifunctional, this template is convenient for dozens of industrial and construction, renovation and furniture, electrician and engineering related topics and niches. With WoodCraft it will never be too expensive to stray far from your locality and engage more and more potential customers. Simply make your website an informative business profile and showcase all kinds of services you offer. Homepage slider is added to the theme to greet your web viewers whenever they browse your website on their PCs or smartphones. Blog area is also available for you to exercise all the legitimate ways of boosting your online presence with the right keywords used. 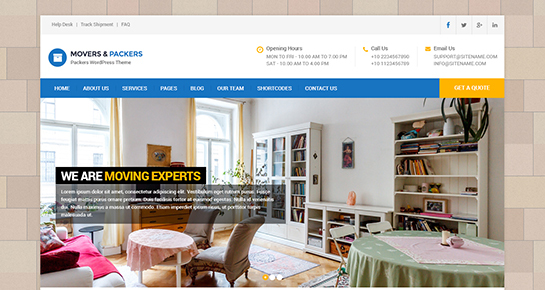 Finally, we came up with Movers and Packers Pro as the last strongly advisable electrician WordPress theme to be found in the current repository of templates. It is another method for advancing your business online while spending minimum financial means for it. The creation and handling of your site will not take you hours of focused endeavor but will be as simple and lightweight as never. Generate more leads through your posts and pages packed with robust navigation and scrolling effects, perfect typography via the given fonts, attractive colors and excellent design touches. The theme also complies with the latest version of WordPress and as such reveals true responsiveness, search engine and social media optimization.